Cathedral Metal File Box Home Office Foolscap Black HOBK Pack of 1 Portable filing system to safely organise documents. Recessed handle. Stackable for easy storage. Accepts foolscap and A4 documents. 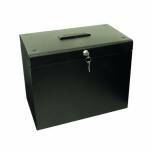 Complete with 5 foolscap suspension files, indexing system, lockable lid and spare key. W425 x D220 x H295mm. Black. Cathedral Metal File Box Home Office A4 Black A4BK Pack of 1 Portable filing system to safely organise documents. Recessed handle. Stackable for easy storage. Accommodates A4 documents. 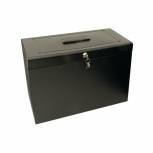 Complete with 5 A4 suspension files, indexing system, lockable lid and spare key. W370 x D220 x H295mm. Colour: Black.